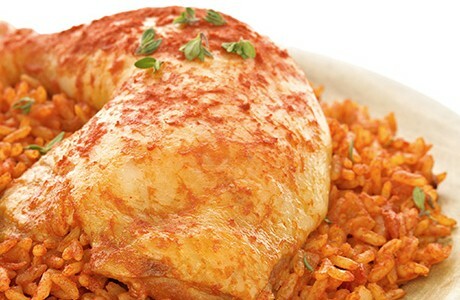 Jollof rice is a traditional dish served across much of West Africa, but has since spread to other parts of the continent. This Nigerian version is quick and easy to prepare but nonetheless tastes delicious. Add the oil to a pan on a medium heat then add the garlic and onions, stirring continuously for 2 minutes. Stir in the tinned chopped tomatoes and stock then bring to the boil. Add Easy Cook Long Grain rice, cover and let simmer for 15 minutes. Remove from the heat and let it stand for 5 minutes covered. Then fluff with a fork & serve (Often with Jerk Chicken).